This dog carries two copies of S which results in a solid coat with no white spotting, flash, parti, or piebald coat color. This dog will pass on one copy of S to 100% of its offspring. This dog carries one copy of S and one copy of sp which results in limited white spotting, flash, parti, or piebald coat color due to the co-dominance of S and sp. This dog will pass on one copy of S to 50% of its offspring and one copy of sp to 50% of its offspring. This dog carries two copies of sp which results in a nearly solid white parti, or piebald coat color. This dog will pass on one copy of sp to 100% of its offspring. The MITF gene, also known as the S Locus, is a master regulator that controls pigmentation. An insertion in the MITF gene disrupts all pigment production resulting in non-pigmented areas with white coat color and pink skin. However, the S and sp variants show co-dominant expression in some breeds when both are present (S/sp), resulting in limited white spotting due to limited expression from each variant. Although there are several other types of white spotting patterns, such as Irish white spotting (si), the DNA variations that cause these patterns are not known. Genetic testing of the MITF gene will determine whether a dog is a genetic Carrier of white spotting coat color. 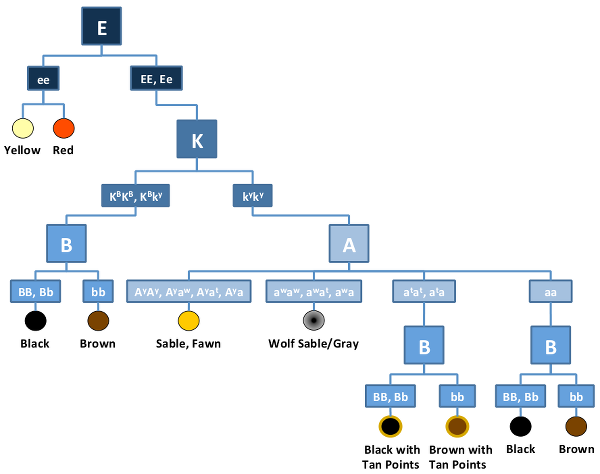 Dogs with an S/S coat color genotype will have no white spotting, flash, parti, or piebald coat color while dogs with an S/sp genotype will have limited white spotting, flash, parti, or piebald coat color. Dogs with sp/sp genotypes will have a nearly solid white, parti, or piebald coat color.